The clock in the vehicle says it's 5:44am, as we pass through a police road block approximately 25 miles from Sendai, the city of more than one million people affected by the tsunami and earthquake. Even though the roads were empty, it took ten hours to drive this far north from Toyko. We're in a two vehicle convoy stuffed to the gills with basic essentials such as water, food and toilet paper as well as one van brimming with enough gear to set up a child friendly space. As the sun starts its slow rise, I make out mountainous silhouettes on either side of the road. The outside temperature is close to freezing and there is thick grey fog. Apart from the cold it is a beautiful place. I wonder though what unsettling sites await us in the coastal areas of Sendai? Fact is this is my first experience of a disaster in a developed country, and I can't quiet get to grips with the fact that there is mass devastation ahead. I'm even more perplexed as we pull into the city. Apart from a large group of Japanese engineers in dark blue uniforms and white hard hats congregated in one ultra-modern office block, there are no clues that a major earthquake occurred here last week. It's not until you leave the city limits and head north-east that the extent of the tsunami damage, triggered by the earthquake, becomes clear. Entire fields are full of debris including corrugated iron, furniture, toys, up-turned cars as well as a bewildering array of bits and pieces. It's possible too that human bodies are buried somewhere beneath the rubble. 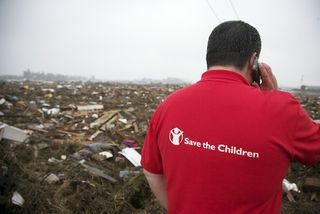 Save the Children team leader Stephen McDonald surveys the aftermath of the the earthquake triggered tsunami which devastated Sendai, Japan. The scenes of devastation here remind me of what I witnessed all over Aceh Province following the 2004 tsunami in Indonesia. It's horrible to think that children might have been killed in the tsunami, or that some of them might have become separated from their families during the earthquake and disaster. Over the coming weeks and months in Japan, Save the Children will provide psycho-social support to children in the form of child friendly spaces. Learn more about our recovery response to the earthquake in Japan. Help Us Respond to the Japan Earthquake Recovery. Please Donate Now. God bless you folks for doing what you do. I wish somehow I could get there to lend a helping hand doing whatever you need. I hope you are well and I apologize for not responding earlier as I have been travelling on emergency response and did not see this! As you probably know we have now phased out of the immediate disaster response – Child Friendly Space program in Japan as children have successfully returned to school 🙂 Currently we are working with children and their families in community recovery programs. Thank you for your support for the children in Japan! Hey administrator, I just wanted to give you a brief heads up that your Website url: %BLOGURL% is being flagged as a possibly malicious internet site in my browser chrome. I would highly suggest having somebody look into it. You could possibly lose a lot of readers due to this issue. Best of Luck.